Hello and Welcome to the first day of sneak peeks for the Sparkle Creations Rubber Stamps December release! Sparkle is releasing 2 new images at midnight EST this Saturday, December 11.. Today we are previewing Cupid Emily! This is sweet (and sassy) Emily playing the role of Cupid! I colored her with Copic markers and added some Star Dust Stickles to her wings. I paired her with some patterned paper from Bo Bunny Crush. My embellishment is a felt heart, topped with a button and heart rhinestone from Pizzazz Aplenty. 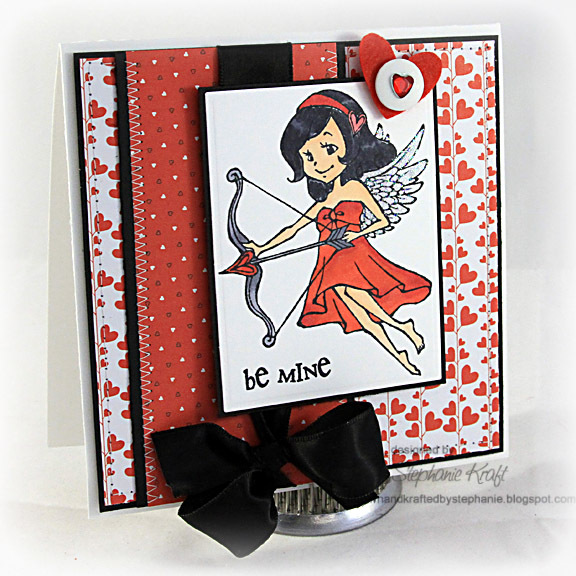 Be sure to visit her and the rest of the SCRS designers for more peeks of Cupid Emily. Sparkle will be giving away a Cupid Emily to one lucky person! For a chance to win, you need to comment on all of the designer's blogs (list below). Then head on over to the SCRS blog and comment on the Emily post. You have until midnight EST each day to comment. The lucky winner will be announced the following day! Suzanne, wonderful December guest designer! Accessories: Rectangle Nestabilities (Spellbinders), Markers (Copic), Star Dust Stickles (Ranger), Felt heart (American Crafts), Button (Papertrey Ink), Heart rhinestone (Pizzazz Aplenty), Black satin ribbon, Foam tape, Thread, Sewing machine. I just love the color combo. Beautiful card, love the stitching detail. Striking colors and design! Emily looks adorable. So clean, so fresh, Fab new image. Very cute love the red and black. This image is so cute I can't wait to see the rest. this is beautiful - love the colors and that heart embellishment detail - fabulous! What a darling card. I love the papers you used. Great card...I like the black ribbon...very attractive! Wow! What an amazing card! Beautiful Stephanie! Love the red and black and your coloring of the adorable image! Love this red and black combo. Such a pretty card. arling card, Stephanie! Grat paper choice!